Home Brian of London Are You One Of The Idiots Who Unthinkingly Believe Hamas Propaganda? Are You One Of The Idiots Who Unthinkingly Believe Hamas Propaganda? Ha’aretz’s Amira Hass has done her usual job of taking a press release from Hamas and turning it into anti-Israel agitprop. And of course, because Ha’aretz is Israel’s premier far-left newspaper, with a vanishingly small circulation but the reputation as Israel’s New York Times, every anti-Israel thing they print goes world wide via syndication and quotation. Amira Hass’s latest is all about the horrific injuries and deaths amongst the obviously innocent, civilian, peaceful protesters at the March of Return. There’s even a funky Infographic and we all know that all facts presented in an Infographic must be true. The headline number: 1700 wounded by “live fire” and 37 killed. That means 1 out of every 45 shot by the ruthlessly efficient Israeli Defence Forces died. Last year in Chicago 3,561 people were shot by a wide array of hoodlums and criminals yielding 625 dead. That’s 1 in 6 killed by bullets. So either the IDF has the least lethal bullets in the world, or “Doctors at Gaza’s Shifra Hospital” (the one directly above the control bunkers Hamas leaders hide in) are lying. One can find estimates that 80-95% of people shot can survive: however the 95% number is if you get to a proper hospital with your heart still beating and with everyone having access to top of the line healthcare. If 80% survive, that would still be 340 dead instead of 37. Whichever way you look at Hamas numbers, they don’t add up. “London-based” group: why would you even report what people based in London think? Meanwhile other reports have Israel as using some kind of unbelievably lethal “Butterfly Bullets”. How does that square with so few deaths? It doesn’t because it is all nonsense. Oh, but you say, perhaps the IDF are so good at only shooting at legs. Well, yes, maybe, but even then, people still die from being shot in the legs. 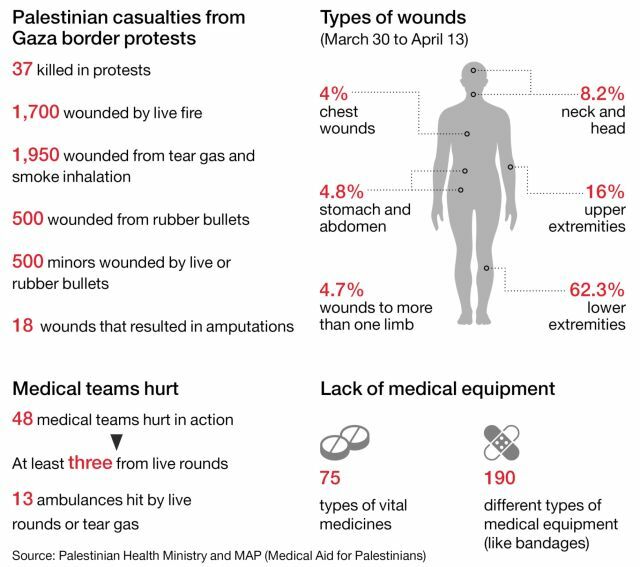 The infographic even gives very specific (rounded to a 1/10 of a percent) info on where these wounded people were shot. Apparently 8.2% were shot in the head and neck. Does that means 139 people received head wounds from real bullets and survived? Truly miraculous. And wounds in the legs and arms can also result in death, mostly from rapid blood loss and especially if the victim is far from medical care. If we add up head, neck, chest and abdomen (all areas that most often result in death) we get 17%: 289 people. And we’re still wondering how more than 250 of these people survived. Are we to believe that the field medicine at the protests is so amazing and evacuation to Gaza’s hospitals is so efficient to explain why so few people shot are dying? Well no, the Infographic says that actually they’re lacking “75 types of vital medicines and 190 different types of medical equipment (like bandages)”. Oh and without any evidence, “48 medical teams hurt in action” including “at least 3 from live rounds”. At least? You don’t really know? The WHO also criticized Israel for harming medical personnel, saying 48 medical staffers have been wounded by Israeli fire while trying to evacuate the wounded. At least three were hit live bullets. In addition, 13 ambulances were hit by live bullets or tear gas grenades. A tear gas grenade bouncing on the roof of an ambulance or a real bullet hole: apparently the geniuses at the World Health Organisation are unable to make a solid count as to how many of each instance there were, lumping these two together. Yet the World Health Organization says the lack of medication and non-reusable medical supplies like bandages is undermining the ability to give patients proper care. The Palestinian Health Ministry urgently needs stocks of 75 essential drugs and 190 types of non-reusable medical supplies. They’re being shot in huge numbers, their medical supplies are insufficient and their medical teams are being shot at. Yet still only 37 people are confirmed killed. It’s a miracle! Then we get numbers like 500 minors wounded by live or rubber bullets: for some reason now these two completely different injuries are being combined. Are you starting to doubt these numbers yet? And when all is said and done, Hamas just can’t help celebrating their dead as Martyrs which inevitably means holding a full military honours funeral and parading around with pictures of the “innocent” dressed in Hamas military uniforms and holding a gun. If it were up to me I’d ban every organisation quoted in this piece from Israel unless they can prove their propagandistic claims. And I’d start to seriously question how someone like Amira Hass and her publisher, Ha’aretz, are able to go on printing these kinds of internally self inconsistent lies without anyone taking them to task properly for this nonsense. And then we wonder why idiot script readers like Natalie Portman think there’s a brutal slaughter going on.